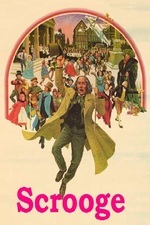 A musical retelling of Charles Dickens' classic Christmas tale (1970). Directed by Ronald Neame, starring Albert Finney and more. This movie is on Youtube. Reviewed here and here. Albert Finney won a Golden Globe for "Best Performance by an Actor in a Motion Picture - Comedy Or Musical "
LOVE this movie. My favorite adaptation of "A Christmas Carol," even though it's musical (a genre that I'm normally quite "iffy" about). This movie hits just the right amount of creepy/scary to sentimentality & lightheartedness that a good Christams ghost story should have in my opinion. Thank You Very Much has got to be the greatest dancing-on-a-grave song ever written. And the greatest such number ever choreographed. He's dancing on Scrooge's coffin while the funeral procession is in motion; seems like a high degree of difficulty. Yes that dancing on a coffin by is incredible, by Anton Rodgers... *quick Google search* who starred in a number of other recogniz--- OH MY GOD HE WAS IN THE PRISONER. This is my favorite adaptation of Scrooge, and who would think it, it's a musical. That's like a high-wire act or something, but they really pull it off, based on the strength of the songs (great lyrics and melodies), coupled with a real sense of play that's missing from other versions of Scrooge. Witness "Father Christmas" early in the show; it's a great set piece that uses the set to the maximum in the choreography, gets across the message of who Scrooge is and how he's regarded in the community, and also gives us good scallywags-scallywagging-around-making-fun-of-"upstanding"-members-of-the-community. That scratches my subversive itch. They don't like Scrooge but he's too well off to ignore or treat poorly. Sound familiar? "I hate people" is just straight-up wonderful, and gives vent to the same (taboo) feelings that "How the Grinch Stole Christmas" does. "December 25" is earwormy; the wistful "You... you were everything to me.." song is Xmas nostalgia and gives depth to the entire show. Alec Guiness is wonderful and a bit hammy too (in a good way). Another thing I really like is they really convey the *cold* in this film - you see breath, you see the snow, creating heat in a house is a big thing, a big, warm, crackling fire connotes luxury and wealth and sociability (the last ghost that appears). The whole thing is a winner for me. There was a period where several presentations of Scrooge on broadcast television were re rigueur for the holiday season. You can lose a fast half hour or more running down the players of the principle parts on IMDB, an amazing list of mostly English character actors of the screen and stage. Though Scrooge is one of the more prominent items on most of their resumes (the notable exception besides Finney being of course Alec Guinness in his fabulously funny, strange and creepy turn as Marley's ghost), many had careers extending well back into the 40s. I have a very special relationship with this story because my father does. He has been re-reading the book every year since he was a teenager. His love for the story, and his passing that on to his sons, compelled me to buy him a 1868 Hurd and Houghton "Globe Edition" complete works set in 1988. In the last decade he's written several hour-long talks about the story, exploring its relationship to scripture and the Catholic Cursillo movement. All of which is to say, no, the musical version just doesn't do it for me.